Well, the victorian ages are finally over. The internal combustion gasoline engine has replaced the need for steam and coal. People have devices in their houses to talk to one another and we no longer burn oil to read at night. These were also the times when we understood electricity well enough where we could really start building the unimaginable. Although nixie tubes were created in the 1950′s, neon signs have been around since the early 1900′s. I have always had an interest in these interesting little tubes and decided to give them a period correct home, albeit strange. This project started out from a kit from tubeclock.com. The only other thing I really needed was a proper clock case which eBay gladly provided for around 20 dollars. The only other things I needed were a few hand tools, clamps, and some wood scrap. As you can see from the picture to your left (click to enlarge), I cut two straps of wood and glued them to the inside of the clock. This served as the mounting point for the tubes. After that, it was a matter of lining everything up nice and plum before I drilled two mounting holes. To finish the project, I smoked the glass to give it a patina’d look. All in all it was a pretty simple and fun project to bring some nixie tubes into my home. In total the project was less than 200 dollars with most of it being spend on the tube kit. More pictures can be found in this flickr album. As you can see from the picture, its a metal apparatus that sits inside a glass tube (removed in this photo) that is filled with neon gas. When an electrical charge is applied to one of the ten digits, cathodes, they glow. They come in many different shapes and sizes and can be controlled in a number of ways. In this case, they are used to display the time. To read more about how they work and where they have been used check out the nixie tube wikipedia article. Thanks to the evil mad scientists for the photo. 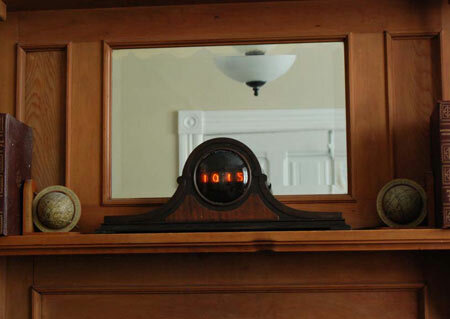 That is one of the coolest mantel clocks I’ve seen. Very fitting for steampunk. Kickass….that’s some Make magazine stuff if I’ve ever seen it…. Neon is still one of the coolest art forms out there, and neon tube artists make a fortune because there aren’t too many of them.